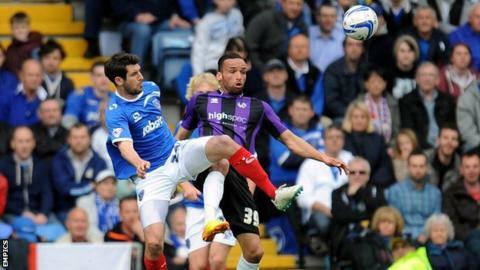 Portsmouth moved closer to safety with a crucial win against struggling Bristol Rovers. Adam Webster put Pompey ahead with a low shot, before Rovers replied through Matt Harrold's deflected effort. Pompey were in front again before half-time, Danny Hollands' deflection wrong-footing Steve Mildenhall, but Rovers equalised instantly through Harrold's second, a header from six yards. Wes Fogden snatched a winner on 70 minutes with his close-range strike. Bristol Rovers, who are just one place above the League Two relegation zone, travel to third-placed Rochdale on Monday night. "That was probably our biggest test since I came in. Fair play to Bristol Rovers, they gave us one heck of a game. "And boy did they - they were absolutely magnificent. I have total respect for the players, they were absolutely superb today." "I asked the players to put a bit of pride back in the shirt and I think they did. "We were a little bit unlucky with the injuries. It changed the complexion a bit. "We were disappointed with the goals we conceded but we got our pride back after last week's woeful performance. "It was about getting the fans back onside. We wanted to win the match but it wasn't to be." Match ends, Portsmouth 3, Bristol Rovers 2. Second Half ends, Portsmouth 3, Bristol Rovers 2. Corner, Portsmouth. Conceded by Seanan Clucas. Attempt missed. Steve Mildenhall (Bristol Rovers) header from the centre of the box is close, but misses the top right corner following a set piece situation. Steven Gillespie (Bristol Rovers) wins a free kick in the defensive half. Danny Hollands (Portsmouth) wins a free kick on the left wing. Foul by Matt Harrold (Bristol Rovers). Corner, Bristol Rovers. Conceded by Adam Webster. Attempt missed. Kaid Mohamed (Bristol Rovers) header from the centre of the box is too high. Bondz N'Gala (Portsmouth) is shown the yellow card. Tom Lockyer (Bristol Rovers) wins a free kick in the defensive half. Substitution, Portsmouth. Patrick Agyemang replaces Ryan Taylor. Attempt missed. Fabian Broghammer (Bristol Rovers) header from the left side of the six yard box is close, but misses to the left. Corner, Bristol Rovers. Conceded by Jack Whatmough. Substitution, Bristol Rovers. Steven Gillespie replaces Tom Parkes. Substitution, Portsmouth. Johannes Ertl replaces Rhys McCabe. Attempt saved. Ricky Holmes (Portsmouth) right footed shot from the left side of the box is saved in the top centre of the goal. Attempt saved. Lee Brown (Bristol Rovers) left footed shot from the right side of the box is saved in the top left corner. Attempt missed. Fabian Broghammer (Bristol Rovers) left footed shot from the left side of the box is high and wide to the left. Attempt missed. Jack Whatmough (Portsmouth) header from the centre of the box is close, but misses to the right following a corner. Corner, Portsmouth. Conceded by Steve Mildenhall. Attempt saved. Ricky Holmes (Portsmouth) right footed shot from a difficult angle on the left is saved in the top left corner. Goal! Portsmouth 3, Bristol Rovers 2. Wes Fogden (Portsmouth) right footed shot from very close range to the centre of the goal. Assisted by Ryan Taylor. Attempt saved. Ricky Holmes (Portsmouth) right footed shot from the centre of the box is saved in the bottom right corner. Corner, Portsmouth. Conceded by Fabian Broghammer. Jed Wallace (Portsmouth) wins a free kick in the attacking half. Foul by Ollie Clarke (Bristol Rovers). Delay in match Tom Parkes (Bristol Rovers) because of an injury. Foul by Ricky Holmes (Portsmouth). Tom Lockyer (Bristol Rovers) wins a free kick on the right wing. Attempt saved. Tom Parkes (Bristol Rovers) header from the centre of the box is saved in the centre of the goal. David Clarkson (Bristol Rovers) wins a free kick on the right wing. Seanan Clucas (Bristol Rovers) wins a free kick in the attacking half. Delay in match Ryan Taylor (Portsmouth) because of an injury.